I used to be the type who goes for the O.G., the original stuff. The days of breaking the bank for collector's editions and McFarlane movie-theme figurines are over. There's no bargain I could refuse. Thus begin my mild obsession with 4-in-1 DVD packs! Two-in-ones, three, four, sometimes fifty-in-ones (ah, MP4s) are quite the norms in pirated wares, but the legitimate faction is also into the bargain pack game, although almost usually with older, evergreen titles. The great thing in going legit here is the quality: pirated bundle-packs usually cram several movies onto a single disc. Depending on the movie lengths, an 8.5 Gb double-layer disc (affectionately called by the pirates as "DVD-9s") is quite a tight fit even for just two movies. Video quality is sacrificed in the process. Get an original many-in-ones though, and you'll not find such compromise. Using dual-side DVDs (equivalent to taking two DVDs and glueing them together on the label side), each movie in a way occupies its own entire disc space, no different than when the movies were produced and sold individually. The Nightmare on Elm Street 4-in-1 DVD pack has Parts I and II printed on the first disc. You watch one movie on one side, then flip it over to see the other. I don't know how the company is able to save cost and lower the prices significantly by using this format, since they would still have to burn the same amount of sides if the movies were produced and sold individually. Physically compacting 4 movies into 2 discs also helps a little in maximising shelf space. 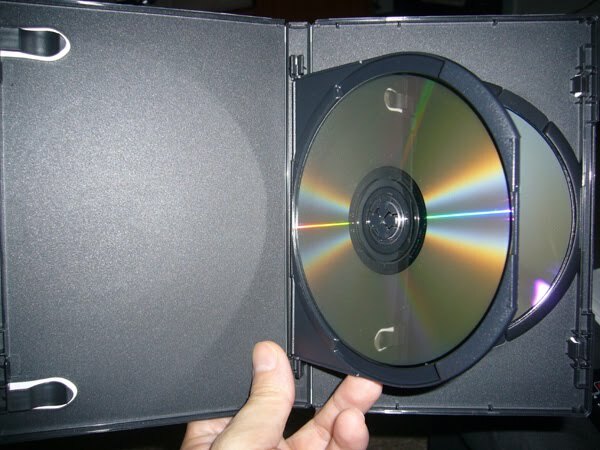 One of the disadvantages of dual-side DVDs is that its "sensitive" regions are exposed on both sides, which encourages easy smudges and all other manner of scratches, the hassle is worth the price tag. Another problem is that one of the mainstays sacrificed in the name of bargain hunters is the second-disc special features. Unless the movie is truly one of your favourites, special features can be quite a chore to sift through. There aren't many titles (with more than two sequels) given the economy pack treatment, probably due to their everlasting appeal (e.g. the pricey Aliens Quadrilogy box set, Harry Potter, Die Hard, James Bond, etc.) So far, I've only found A Nightmare on Elm Street (pictured above), Lethal Weapon, Ocean's Eleven, Batman, Rush Hour, etc. There are some eco-packs that are a mixture of unrelated titles, but these are usually two-packers than four. In conclusion, original 4-in-1 DVD sets are great value for money and takes no more shelf space than a standard DVD box does. Titles available on these four-packers aren't wide, though, and special feature discs that accompany the main feature on the individual DVDs are usually left out of the set. The highly exposed discs get easily damaged too, if you have butter fingers. Next up: A Nightmare on Elm Street - The Review!